Seattle Seahawks quarterback Russell Wilson signs autographs after practice Tuesday in Renton, Washington. It wasn’t long after the Seattle Seahawks put the finishing touches on their 43-8 Super Bowl rout of the Denver Broncos that media people began throwing around the d-word, dynasty, as they peered into the franchise’s future. Of course, this happens with just about every Super Bowl winner; squint hard enough, and even the most obvious one-and-done champ looks like a perennial powerhouse. (In some ways, talk of that nature gets even more far-fetched with each passing season — we haven’t seen a repeat Super Bowl winner since the 2004 New England Patriots.) But in Seattle’s case, it might not be totally implausible to expect an elevated probability of a full-blown dynasty. Historically, teams that have won a title find themselves surprisingly well-positioned to win more of them. Since the 1970 NFL-AFL merger, 55.9 percent of Super Bowl winners won at least one more championship within the following 10 seasons. Even within that club, though, Seattle is starting from a better spot than most. Its schedule-adjusted pythagorean winning percentage during the 2013 regular season ranked sixth among all Super Bowl champions since the merger, trailing only the 1985 Chicago Bears, 1991 Washington Redskins, 1975 Pittsburgh Steelers, 1996 Green Bay Packers and 1973 Miami Dolphins. Looking at all Super Bowl winners from 1970 to 2003 (for which we have a “next decade” worth of data), there’s a relationship between the team’s AV-weighted age in its championship season and its chances of winning additional titles. 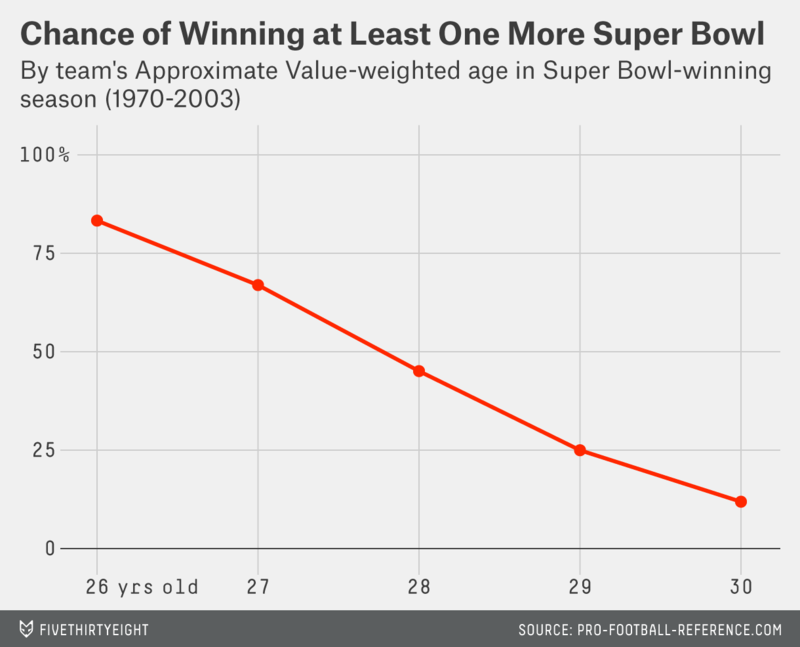 Among the aforementioned 55.9 percent of all Super Bowl champions who won another before a decade was up, a disproportionate number are clustered among the youngest teams on the list. Eleven of the 12 youngest champions in our 1970-2003 group went on to win at least one more Super Bowl in the following decade, while only four of the 12 oldest champs would go on to win another title. Usually, talk of dynasty potential among freshly christened champions isn’t very predictive. But because of their youth, these Seahawks are in a situation where the odds of winning another championship are particularly heightened.